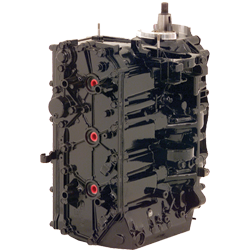 Remanufactured back to Mercury & Mariner factory specifications. 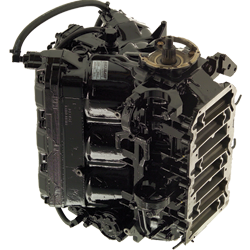 Remanufactured outboard powerhead (Carbureted technology). Fits oil injected Mercury/ Mariner 75/90hp. Carbureted outboards (s/n 0D283222 and above). This replacement powerhead works in both CDM and non‑CDM applications. 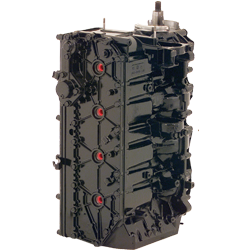 Remanufactured outboard powerhead (Direct Fuel Injection technology). Fits Mercury/Mariner 75hp. DFI (1.5L) outboards, serial number 0T980000 and above. 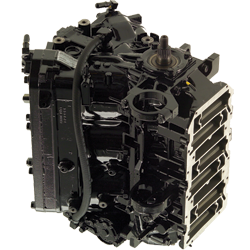 Fits Mercury/Mariner 90/115/125hp. DFI (1.5L) and the 115 Pro XS outboards, serial number 0T801000 and above. Fits oil injected Mercury/ Mariner 100/115/125hp. Carbureted outboards (s/n 0D283222 and above). This replacement powerhead works in both CDM and non‑CDM applications. Fits the Mercury/Mariner V‑135/150 Optimax (2.5L), 0T178500 and above. 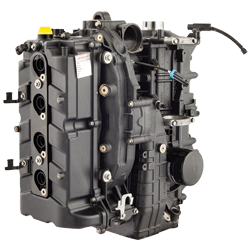 Remanufactured outboard powerhead, both Carbureted and Electronic Fuel Injection technologies. Fits the Mercury/Mariner V‑150/V‑150 XR6 Carbureted (2.5L) outboards (0G960500‑1B226999), and fits the V‑150 EFI (2.5L) outboard (0G960500‑0T408999). Fits the Mercury/Mariner V‑150 XR6 (2.5L) outboard (0D082000‑0D284287), and the V‑175 Carbureted and EFI (2.5L) outboards (0D082000‑0G960499). 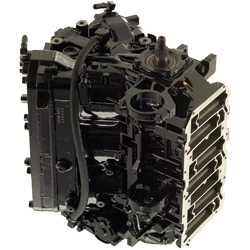 Replaces 2000‑2001 Mercury or Mariner 175 Horsepower 2.5 Litre V‑6 engines with O‑ring design heads. EFI fuel system only (s/n G960500‑0T408999). 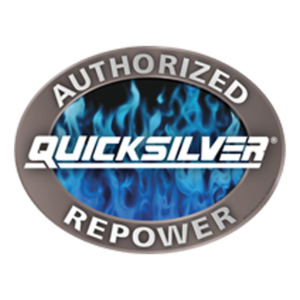 Remanufactured outboard powerhead, Electronic Fuel Injection technology. 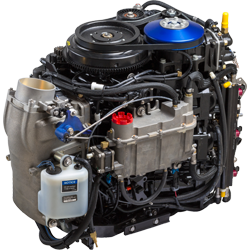 Fits the Mercury/Mariner V‑175 EFI (2.5L) outboard (0T409000‑0T800999) and fits the V‑200 EFI (2.5L) outboard (0T409000 and above). Fits Mercury/Mariner V‑200 Carbureted or EFI (2.5L) outboards, 0D082000‑0G960499. Fits the Mercury/Mariner V‑200 Carbureted (2.5L) outboard (0G960500 and above), and fits the V‑200 EFI (2.5L) outboard (0G960500‑0T408999). Fits Mercury/Mariner V‑200 DFI OptiMax (3.0L) outboard, 0T178500‑0T598999. Fits Mercury/Mariner V‑200 DFI OptiMax (3.0L) and the 200 Pro XS outboard, 0T599000 and above. 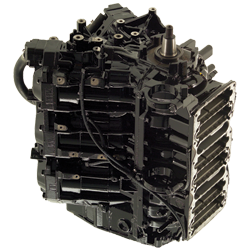 Remanufactured outboard powerhead, Electronic Fuel Injection technology utizing an electric oil pump. Fits the Mercury/Mariner V‑225 EFI (3.0L) outboard, 0T409000‑1B417701. Fits the Mercury/Mariner V‑250 XS, DFI (3.0L) outboard (0T651945 and above), and also fits the V‑250 Pro XS, DFI (3.0L) outboard (1B426561 and above). Fits the Mercury/Mariner V‑225 OptiMax DFI (3.0L) outboard, 0G590000‑0G960499. 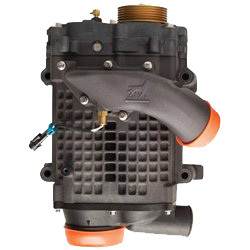 Remanufactured outboard powerhead, Direct Fuel Injection technology utilizing head castings with NO cast number. Fits the Mercury/Mariner V‑225 Optimax DFI (3.0L) outboard, 0G960500‑0T090166, no head casting number. 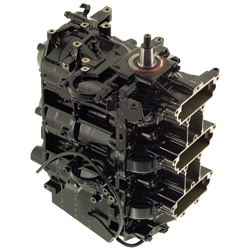 Remanufactured outboard powerhead, Direct Fuel Injection technology utilizing heads WITH a casting number. Fits the Mercury/Mariner V‑225 Optimax DFI (3.0L) outboard, 0T09167‑0T178499, with a head casting number. Fits the Mercury/Mariner V‑225 Optimax DFI (3.0L) outboard, 0T178500‑0T598999. Fits the Mercury/Mariner V‑225 Optimax DFI (3.0L) outboard, 0T599000 and above. Fits the Mercury/Mariner V‑225 Pro XS, DFI (3.0L) outboard (1B104549 and above), and also fits the V‑250 DFI (3.0L) outboard (1B528615 and above).